The reusable PICCGard will keep your dressing dry – day after day. Our newest model is the PICCGard, made specifically to protect PICC lines and mid-arm dressings while keeping the hand free to allow normal showering. The PICCGard is made of polyurethane — a virtually indestructible material that’s 40 to 50 times stronger than materials used by our competitors. It will not tear and stretches easily to form a comfortable, non-constrictive seal. Made in one piece, the PICCGard has no straps, pump, ring, or diaphragm. Because of the strength of polyurethane construction, the PICCGard can be used again and again, and will often outlast a patient’s convalescence. The risk of allergic reactions to latex is one we’re not prepared to take. Rather than expose patients to the possibility of anaphylactic shock, we rely on the safety of latex-free polyurethane. PICCGard models cost $32.50 (includes Priority Mail postage). Call 1-800-338-8512 to order. Watch the demonstration on how to keep your dressing dry while showering. The PICCGard is available in three sizes – no cutting or trimming required. 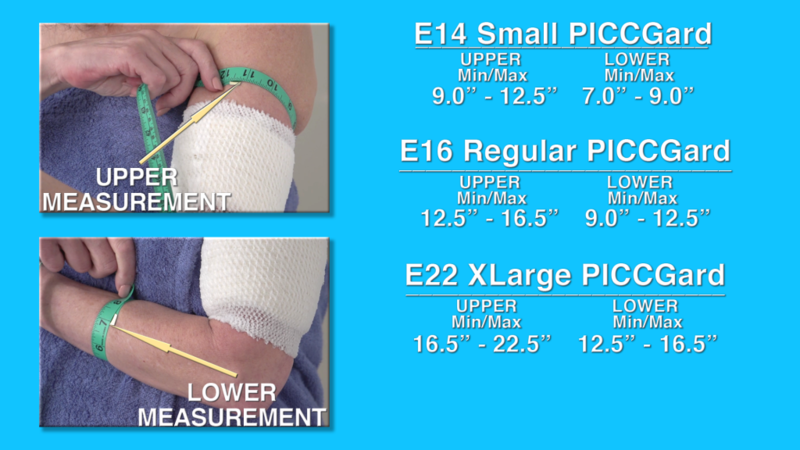 For the best fit, simply measure the circumference of the limb above and below the dressing and select the appropriate size. Choose the proper size to ensure waterproof protection. PICCGard models cost $32.50 (includes Priority Mail postage). Call 1-800-338-8512 Mon-Fri 8am – 4pm Pacific Time to order today. *Recommended for showering only. Please check with your doctor first, but if you wish to swim with a PICC line we suggest you try our AquaShield Regular Full Arm (fits most adults) or Small Full Arm (fits most children).